The shapely hummocks of the Mourne Mountains stood muted and insubstantial under a cloud-blotched sky and a pale sun. Wrens sang in the flowering gorse bushes along the lane from Meelmore Lodge. 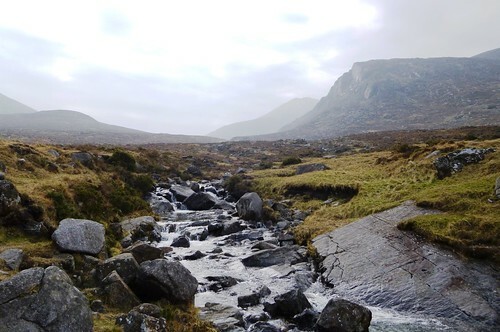 The western face of the Mournes rose before us, the jagged profile of Slieve Meelmore and the rounder bulk of Slievenaglogh framing the hollow where the Trassey Track snaked in its long climb to the Hare’s Gap. Generations of quarrymen forged the track and its tributary paths to the granite quarries that floored and walled the industrial north of England in the 19th century. 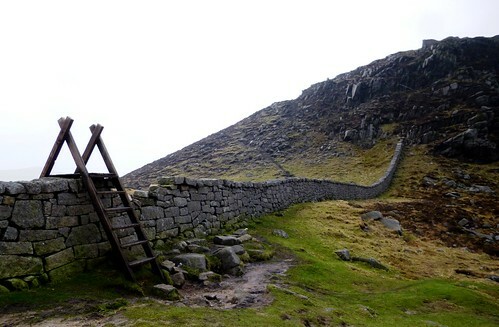 The zigzag path rose steeply to where the flat saddle of the Hare’s Gap was seamed by the long dark line of the Mourne Wall. 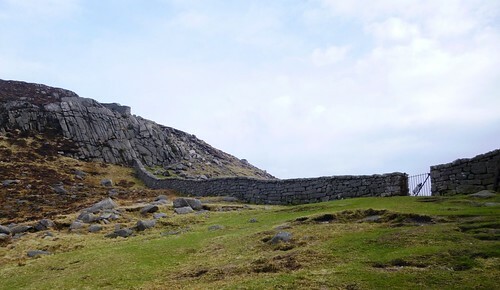 This remarkable construction of roughly squared granite blocks, built by hungry men in the early 20th century to earn themselves a crust, circles the high top of the Mourne Mountains for 22 miles, swooping up and down all the major peaks. Once across the wall we got a breathtaking prospect of the heart of the range, from the castellated crags of Slieve Bearnagh and the knobbed peak of Ben Crom overhanging its namesake reservoir to the long graceful nape of Slieve Donard, tallest of all. Smugglers, ne’er-do-wells and travellers in a hurry used to cut across the high Mournes from the sea by way of a rough path known as the Brandy Pad. 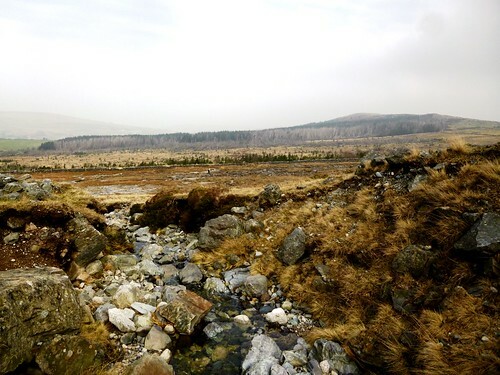 We followed it towards Slieve Donard along the slopes of Slieve Commedagh, through a high bleak landscape where meadow pipits fluttered and cheeped, and a solitary raven croaked a warning ark-ark-ark-ark to his mate invisible among the rocks. Clouds built and melted, rain spat and subsided, and Slieve Donard pulled a shawl of thick mist over her head. Under the mountain we recrossed the Mourne Wall and went stumbling and splashing down towards Newcastle in the company of the Glen River, a noisy little chute of rapids and cascades. 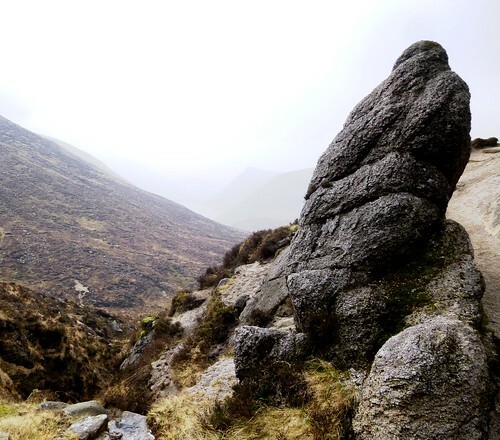 A walk in a Mourne heaven – nothing soft or accommodating about it, everything stark, hard and beautifully wild. 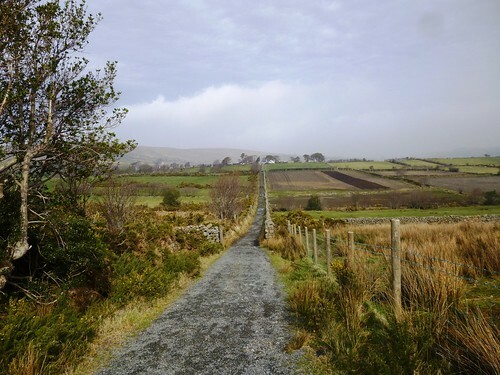 Start: Meelmore Lodge, Trassey Road, near Bryansford, Co Down, BT33 0QB (OSNI ref SB 305307). Getting there: Mourne Rambler bus service in the summer (mourne-mountains.com). 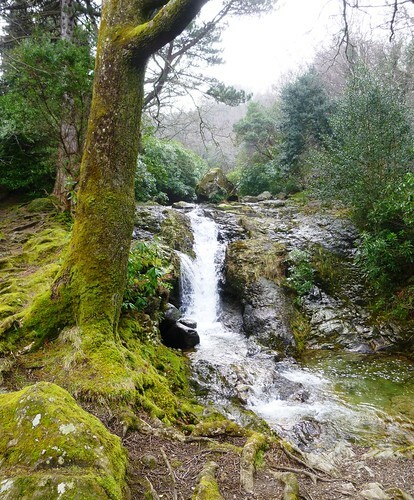 Walk (7 miles, moderate/strenuous, OSNI 1:25,000 Activity Map ‘The Mournes’. NB: online map, more walks at christophersomerville.co.uk): From car park, left up stony lane (‘Mountain Walk’ sign on wall). Through right-hand of 2 gates; follow lane to cross field wall (308302). Left (‘Mourne Way’) for 500m; right up stony Trassey Track. 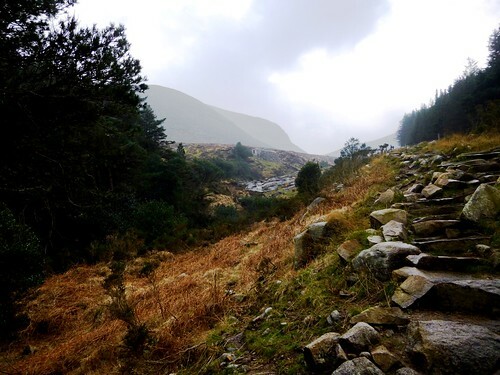 In 1 mile track crosses river and bears right; but keep ahead here, steeply up to cross Mourne Wall at Hare’s Gap (323287). Left at cairn along Brandy Pad path for 1½ miles to cairn on saddle between Slieve Commedagh and Slieve Beg (342278). Bear left at cairn, under The Castles crags. At end of crags (348277), fork left, up to cross Mourne Wall (350279). Descend beside Glen River. In 1½ miles, pass Ice House (364295). In 200m at dirt road/concrete bridge, descend left bank of river. In 400m, right across bridge (379299); descend right bank. In 350m, left across Donard Bridge (372302). Descend left bank; through Donard Park into Newcastle. Conditions: Some steep parts; slippery underfoot in woods. Walking stick advisable. Dogs on leads. Refreshments: Meelmore Lodge café (028-4372-5949); Villa Vinci, Newcastle (028-4372-3080).